Here is a result of quite a few years of on and off writing as I have continually added material from new observations, fan discussions and ideas and several revelations from Doug Adams into the text. I offer first the thematic analysis of the score with the track-by-track analysis of the Special Edition soundtrack album coming later. As always comments and observations, improvement and addition suggestions are most welcome. Thanks to all the fine folks here and elsewhere for your insight and help in parsing through these magnificent scores: KK, Jay, Georg, Faleel, BloodBoal, Barnald and all others! In a hole in the ground there lived a Hobbit. These words begin the classic children’s novel written by J. R. R. Tolkien, a work that has now been adapted into a motion picture trilogy by director Peter Jackson and his film making crew. The Hobbit: An Unexpected Journey, first instalment in a trilogy of films, opened in mid-December 2012 to much anticipation from the fans of Tolkien and his beloved novels and also the film buffs, who first fell in love with Middle-earth and its multitude of characters with the award and audiences winning Lord of the Rings movie trilogy. Nearly a decade has passed since the last journey to these mythical times and lands with Return of the King and audiences were expecting the new Hobbit films to capture the same vibrancy, sense of grandeur and scope as its predecessors that have established themselves as the modern classics of the fantasy film genre. The enormous box office winnings did indeed indicate massive interest from the movie going public for this new outing to Middle-earth although the critical reception varied from tentatively positive praising the actors, visual grandeur and production design to lukewarm and negative with the new high frame rate 3D, the lack of emotional resonance, slow pacing, overt humour, episodic nature of the film and stretching of the story of the novel too thin and adding extraneous elements meant to tie The Hobbit together with LotR mentioned as the worst offenders. During the award season of 2013 the film was mostly left without accolades outside the effects and production design department. The story of The Hobbit is set 60 years before the events of the Lord of the Rings and focuses on Bilbo Baggins, at first an ordinary stay-at-home Hobbit, a model of a country gentleman, who is thrust into an adventure by a wandering wizard Gandalf, who arrives one day with 13 dwarves in tow and coaxes the timid halfling from the comforts of his hobbit hole into the wide world and on a Quest to retake the dwarven kingdom of Erebor, the Lonely Mountain, from a monstrous dragon Smaug the Golden, who had pillaged it more than a century before and is rumoured to guard its wealth still. Bilbo encounters all kind of dangers and marvels on the road and in the Wilderland on his way to the far-off mountain in the East and will learn that he might not be as timid and soft as he thought himself to be and finds the qualities that the wizard Gandalf the Grey saw underneath the gentle exterior of the Hobbit, simple courage, loyalty, quick wit and the heart of a hero. The movie features an impressive cast: Martin Freeman famed for his comedic roles and most recently for his work as John Watson in the retelling of exploits of the world's greatest consulting detective in Sherlock stars as the young Bilbo Baggins, Ian McKellen returns to reprise his role as Gandalf the Grey along with the Lord of the Rings veterans Ian Holm (old Bilbo Baggins), Hugo Weaving (Elrond), Cate Blanchett (Galadriel) and Christopher Lee (Saruman). We also meet an entire troupe of new faces, namely the 13 dwarves led by the proud and heroic dwarven prince in exile Thorin Oakenshield (Richard Armitage), his old and wise right hand warriors Balin (Ken Stott) and Dwalin (Graham McTavish) and young heroic brothers Fili and Kili (Aidan Turner and Dean O’Gorman) to name only a few of the ensemble cast. Other returning film makers from the Lord of the Rings team are the screen writers/producers Philippa Boyens and Fran Walsh, artists and concept designers John Howe and Alan Lee, production designer Dan Hennah and the director of photography Andrew Lesnie and virtually armies of extras, special effects people and craftsmen (and apparently half of New Zealand) again taking part in the giant effort of creating these films. Also, most would say inevitably, returning was the composer Howard Shore, whose contributions to the Lord of the Rings were an integral part of the fabric of these films and has since become a phenomenon in and on itself. The composer seemed to capture in his previous trilogy of scores exactly the right tone and style for Tolkien’s creation. Shore built a highly dense yet fluid leitmotific work with which to address the story, not only expressing the sheer emotional breadth and spectacle of the tale but also the multifaceted subtext of Tolkien’s complex imaginary world, offering a wide ranging musical mirror to the author’s work, that helped the audiences to immerse themselves in this epic tale and resonated outside the cinemas and has in the intervening years become a musical event, the live projections of the trilogy with orchestra and chorus played to packed houses and a symphony culled from its themes frequently heard in concert halls around the world. As the rumours of the new trilogy of films began to circulate, Shore mentioned in interviews that he was very much anticipating another adventure in Middle-earth as he had read Tolkien’s works as a 20-year old and rediscovered the novel during the scoring of the trilogy and had always held a deep affection for Tolkien’s world and writings, especially sharing the author’s keen love of the natural world. Finally the legions of the composer’s fans sighed with relief when he was officially announced as the composer of the pair of Hobbit films in 2012, although one could hardly imagine anyone taking up the mantle from him. Shore seemed to be destined to complete his epic Ring cycle with two full scores. But soon it was announced that there would be three films as there was such abundance of material written and shot that it would require three movies to tell the whole story. So as another trilogy awaited the composer, undoubtedly an epic undertaking in every sense of the word given his previous success, the fans were waiting with with growing anticipation for new musical bounties. The new score presented Shore a challenge and opportunity that must have been as similar as it was different from what had come before in the Lord of the Rings. The approach was once again to be Wagnerian with multitude of leitmotifs leading, enhancing and supporting the narrative as they had done for the previous trilogy. The new tale needed of course new themes for a whole plethora of concepts, the novel a rich inspiration and source for possible central musical ideas. The story is set in the same Middle-earth, only 60 years prior to the world changing events of Tolkien’s magnum opus, and as a children’s book The Hobbit is tonally much lighter, innocent and whimsical than its “sequel”. With the new films Peter Jackson certainly created a movie saga somewhat lighter in some respects than its predecessors, humour, comedy and playfulness holding upper hand for surprisingly long stretches at a time and so the music would have to follow suit, creating a good humoured, bubbly and sprightly tone for the adventure of a wizard, an accident prone band of dwarves and one fussy, nervous and out-of-his-element Hobbit. On the other hand there is a more serious and darker strain running through these films that gradually builds over the trilogy as the movie makers also sought to connect this new trilogy tonally with The Lord of the Rings. And thus the foreboding mysteries surrounding the growing darkness in the world and the dangerous enemy that is hunting the dwarves and their leader Thorin in particular demanded appropriately brooding, aggressive and doom laden musical signatures presaging the solemnity and resoundingly dramatic approach of the Lord of the Rings. One interesting aspect pointed out by the film makers and Howard Shore himself is, that the film is nestled in the The Lord of the Rings, existing both inside and outside the larger story, as it opens with the older Bilbo writing his memoirs There and Back Again at Bag End on the eve of his 111th birthday, which is the starting point of The Fellowship of the Ring. This offers an interesting position for a composer to work forward and backward through his musical storytelling. In addition to writing new thematic material (of which there is a large collection) Shore wisely and logically employs in his thematic structure his well established themes for several places and characters from The Lord of the Rings that make reappearance in this new trilogy. The scores for The LotR were strongly focused on the different cultures of Middle-earth and the music of the Hobbit trilogy continues with the same philosophy with Shore now expanding the palette into new areas as the characters and the audiences encounter uncharted places, lands and people on this cinematic journey.The old leitmotifs from Lord of the Rings work both as musical call backs that impart a sense of familiarity and certain a dose of nostalgia, drawing the audiences comfortably back into the world of Middle-earth and also represent certain unchanging elements in this story and in part create a continuity between the trilogies. Likewise this story within a story allows Shore to expose the roots and origins of some of his musical ideas, giving him an opportunity to develop or establish the history of his grand musical architecture in The Hobbit films and to foreshadow The Lord of the Rings with his new music in a satisfying way. And while Shore’s score does all this, walking a fine line between familiar and fresh, it retains an established soundscape but naturally expands upon its foundations and explores interesting new avenues and uncharted ways in the musical Middle-earth. Peter Jackson has stated in a number of interviews that scoring the first film of this new trilogy was to him the hardest, because it contained so many familiar elements to it, which required a lot of references to the old thematic ideas for quite a number of well-known characters, events and locales the film was revisiting. The director gives the impression that he and composer Shore were somewhat tied down by the old call backs and that the music could not contain much new elements as the audience had to be eased back into the world of Middle-earth. While this might be partially true, Shore's original concepts which are represented on the soundtrack albums seem to be very clear and precise and he created a lot of new material that was either completely new and original or musically derived and grew organically from the previous themes featured in the Lord of the Rings trilogy. In the final film the score compared to the earlier version locked down for the soundtracks is much different, stemming probably from Peter Jackson's and the film makers' difficulties in defining which elements of the story would need new thematic representations and which should be again depicted by the well established themes from the previous films. Naturally film making is a collaborative and organic process and sometimes you can't know what will work with the film and what will not until you see the sight and sound put together and this might well have happened with the first Hobbit film despite careful preparation begun well beforhand the scoring sessions. One major change that certainly affected the music was the sudden decision to divide the films not into two but three parts, which must have caused furious recutting (and partial reshooting) of the first film that necessitated revision of the music as well. The original version of AUJ was to end well into the Wilderland with the Forest River chase in Mirkwood but when two films became three, the structure of the narrative was revised and a new ending was devised for the first film. The Special Edition soundtrack album has some vestiges of this in the bonus tracks where we have evidence of one particular scene from original film 1 that was moved to film 2. This is the music for Gandalf's visit to the High Fells in Rhudaur (titled Edge of the Wild on the album) which was then moved to film 2 and rescored in the process. But undoubtedly this shift affected the scoring process in other ways as well. It is normal for the film makers to re-evaluate the film and its post production aspects continually and this process usually stretches to the final minute when Peter Jackson's epics are concerned, but with An Unexpected Journey it seemed to go on for unusually long. The collaboration between Shore and Jackson was very close on Lord of the Rings and Jackson himself was present at the recording sessions in London during the hectic post production schedule of these massive films. The film makers had with the previous trilogy revised the meaning of scenes through the change of music and thematic content a number of times when the film seemed to need something else, either more or less from the music, and this is very normal procedure when the composer and the director are conforming the music to the images at the recording sessions. Such recording session collaboration took place with the AUJ in a normal fashion with Peter Jackson present in London to hear Shore record his score with the London Philharmonic Orchestra and the London Voices while also conducting the postproduction process in New Zealand. This time however it seems that the whole initial concept of providing specific music for the character of hobbit Bilbo Baggins was replaced almost entirely by variations on the previously composed Shire themes. 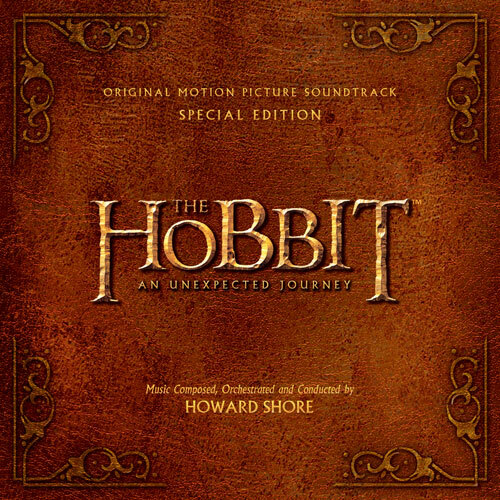 The soundtrack album testifies this as many scenes with Bilbo's new themes were at the centre of the musical meaning and subtext but in the end Jackson and his team came to the conclusion that many of these moments needed to give emphasis to the nature of hobbits rather that specifically to the nature of Bilbo and thus this meant Shore had to entirely rewrite the music for those scenes. And if this was not enough many of the revised pieces were modelled very closely to the pieces written for The Lord of the Rings mirroring their outline and contour in orchestrations and content, making it sound like they were in fact not new music at all but re-recordings of previous compositions from Lord of the Rings or as some speculated simply tracked (using existing music from another source) from the soundtracks of those films. Same fate befell the music for the eccentric wizard Radagast the Brown whose music was toned down significantly. One could speculate that this musical material was too colourful, too prominent and too intricate. Perhaps they discovered also this during the scoring process when looking at the pictures with the finished film so Shore's layered and multi-part thematic constructs were severely streamlined. The final bigger revision and rewriting was done for the finale of the film, where Shore's original music was largely replaced by a series of call backs to the old themes and moments from the Lord of the Rings trilogy, the director obviously struggling hard to try to define the tone and meaning of the film through musical choices up to the last minute. The last choral sessions that finished the recording process ended at the end of November only a few weeks before the December premiere of the film at Wellington. While such musical changes are everyday occurrence in films and film music business, they are no less unfortunate in the light of how interesting and downright beautiful Shore's initial unused concepts were. But luckily we can enjoy them all on the soundtrack album for The Hobbit: An Unexpected Journey. As mentioned above The Hobbit continues firmly on the established musical path of the Lord of the Rings, Shore approaching this first instalment of the new trilogy and the beginning of the eventual six film series as a part of a grand leitmotific opus. Highly thematic, blazingly dramatic and as colourful and complex as its predecessors, the score for The Hobbit: An Unexpected Journey is a carefully built and intelligent piece yet retains the same melodically lyrical and directly resonate emotionalism that made Lord of the Rings such a success. As mentioned above the musical focus on the different cultures of Middle-earth, which was so emblematic to the LotR scores, is again present here and the dwarven culture is now given, through the 13 protagonists, a major spotlight not only in the film but also in the music without forgetting other elements of the story, the hobbits, the world of the elves, forces of Evil, the Wizards and the Nature itself. And as with The Lord of the Rings Shore not only paints the cultures with a multitude of themes but he also establishes specific instrumental colours and orchestral techniques for each of them. Another noteworthy aspect in these scores theme-wise is how many character themes Shore has composed for the new trilogy. The composer has often spoken of how he writes his thematic material partly inspired by the book and its ideas and obviously the text spoke to him on this character level, of the need for individual themes for important individuals. Shore not only creates single themes for these people but assigns some of them several to denote their different aspects throughout the story and to reflect their character growth. Bilbo, Thorin, Gandalf and Radagast all have their own prominent themes in AUJ and we can hear this approach expanding with each new film with new characters central to the plot making apperances. Similarly Shore's cultural themes that were relatively isolated in the Lord of the Rings start in the Hobbit scores to travel and interact and forge connections as the dwarven company crosses the strange lands and meets all manner of creatures and races. Thus e.g. elven music and dwarven music come to share certain characteristics although they are initially drawn with a very culture specific musical brush. Some subtle hints of this appear already in An Unexpected Journey but this development becomes more and more prevalent in the sequels. Shore expands the dwarven musical world significantly in this new trilogy. The musical structures that were previously heard only in isolation in Moria and in the weighty orchestrations that followed Gimli in LotR are now further explored and expanded. The musical ideas still retain the stoic, proud and steadfast progressions established for the dwarven race but now gain a living, breathing energy as the themes travel through the musical landscapes of the story. Still there is a lingering sense of antiquity to the Dwarven music and as this is a culture very much in decline at the opening of the first film it is often sombre and melancholy nature. Doug Adams describes this motif in his liner notes for the Special Edition of the soundtrack album as proud and compact figure rising in three horn calls (A-C: A-D: A-E). This thematic motto aptly depicts the wealthy, proud and powerful dwarven kingdom of Erebor, the Lonely Mountain, the shape of the musical figure ever rising upwards like the solitary peak itself, while the lower brass and string figures gracefully form its more sombre downward slope. The Erebor theme also possesses some of the unyielding spirit of the dwarven race in its stubbornly rising progression that sings out their defiant heroism. But it feels oddly incomplete and although it is a heroic exclamation, it also becomes like an ever haunting and obsessive memory for the leader of the dwarven company, Thorin Oakenshield, as vengeance upon Smaug and reclaiming of the kingdom burn ever in his mind, a yearning call of home and lost glories. At other times the Erebor Theme transforms into a heroic call to action for the entire dwarven company, rising with resolute vigour amidst the battle and remains one of the most constant elements of the dwarven thematic family throughout the three films, as the ever present memory their mountain kingdom that springs Thorin's company to action. A noble and longingly developing melodic line paints a thoughtful, proud and slightly melancholic image of the dwarven prince in exile, the music capturing the inherent heroism, resilience and will but also the sorrow he carries for his people and their lost realm and his duty as the prince of the noble house of Durin and the Longbeard dwarves. The theme develops in a very Dwarvish fashion yet contains more warmth and direct emotionality than the often stoic music of race. Doug Adams mentions in his liner notes that the theme’s opening contains the same stepwise motion as the Shire theme, linking Thorin’s fate together with Bilbo’s but also with the larger canvas of Free Peoples of Middle-earth, whose themes are generally built on the whole step progressions in Lord of the Rings. Thorin’s own thematic material is seamlessly wedded to Erebor’s rising figure, the exiled king and his realm indelibly linked to one another, the roots of the prince’s theme actually derived from Erebor’s. A weary and grim gradually rising and falling arpeggio motif seems to revolve around the exile and subsequent degradation of the fortunes of the people of Erebor and Durin's folk and relates to the dwarven suffering and fate. It also ties strong with horin’s sense of pride and honour and often stubborn unbending will and Thorin's obstinate way of keeping of grudges born out of the endured injustice and suffering. This music is first encountered when after Smaug’s ruthless assault the young dwarf lord leads his people with his father and grandfather from the smoking ruin of Erebor into their long exile and calls in vain for the Wood Elves and their king Thranduil for help, the whole Elven race earning his eternal enmity for abandoning the dwarves in their hour of need. The theme also seems to illustrate Thorin’s duty as the heir of the Lonely Mountain and his regret for the exile of Durin’s folk and longing for their lost realm. This figure bears resemblance to the arpeggiated rising and falling figures of Weakness and Redemption motif introduced and frequently threaded into the musical fabric of Lord of the Rings and it also appeared in those scores inside several themes (e.g. Rivendell, Gollum) and at moments of defeat and sudden fortuitous turn of events as the main characters either fell to temptation or weakness or rose to victory over arduous odds, often not defeating an enemy in the process but rather their own weaknesses. The arpeggiating line also draws connections to the elven music as Shore typical to Hobbit scores starts to blur the musical lines between the cultures and here reflects Thorin's frustration over the elves' inaction and refusal to help with a long more elegant figure usually outside the dwarves' musical vocabulary. Arkenstone, the Heart of the Mountain, the most prized heirloom and treasure of the kings of Erebor, a multifaceted and magically radiant white jewel very fittingly earns in Doug Adams's words a glowing choral cluster and a stately string line in B Minor that exudes almost supernatural ethereal awe and light of its own. This motif is further developed in the sequels but in this score the tentatively introduced idea shows still only a fleeting glimpse of its true meaning and musical form. In AUJ this this same figure seems also to be linked to the key and the map that Gandalf hands down to Thorin, a gift from his late father Thráin. These two heirlooms become an integral part of the plan of the dwarves to get into the Lonely Mountain and Shore musically foreshadows their significance in winning back the kingdom of Erebor and links them to the central role Arkenstone will play in the subsequent films. These two artefacts will enable Thorin and his company to reclaim the Arkenstone for their purpose of uniting their brethren from four corners of the world. The central dwarven thematic idea of The Desolation of Smaug and The Battle of the Five Armies, the theme for the House of Durin makes its initial disguised major mode variation in the opening and closing sequences of An Unexpected Journey. This noble, dignified yet introspective theme is a musical hybrid that combines the attributes of both Thorin’s and Erebor’s themes, creating a longing climbing figure that speaks of the dwarven prince’s yearning for his home, the loss that the race of Erebor has endured and the unbending nobility of the dwarven company as they attempt to retake their former home. Shore makes a connection between the dwarven culture of Moria and Erebor with this theme, both grandest dwellings of the House of Durin as the theme is in part modelled after the faded glory of the Dwarrowdelf theme. It marks Thorin’s noble heritage as the heir to the throne of the Longbeard dwarves and fittingly opens the whole story of the Hobbit with a musical hint at the central element of the plot, Thorin Oakenshield and his dwarven company that sets Bilbo on his fateful Quest. It will later take on a nobler guise as the company nears Erebor but here in AUJ it is still just a musical hint of its coming prominence. This theme starts as a piece of diegetic music, a song sung by the dwarves at Bag End, the lyrics adapted from Tolkien’s poem Far Over the Misty Mountains Cold, which is derived directly from the novel itself and tells of the glory of the dwarven kingdom, the dragon’s sudden attack on Erebor, the kingdom’s subsequent fall and of the noble venture of returning to the Lonely Mountain one day to wrest it all back from Smaug. The melody of the song was not composed by Howard Shore but by a New Zealand based group of musicians called Plan 9 (David Donaldson, David Long, Steve Roche, Janet Roddick and Stephen Gallagher), who handled all the diegetic music (music heard from an on-screen sound source, such as a song or instrument played by a character) for The Lord of the Rings trilogy and again for The Hobbit films. As the song had to be performed by the actors in the opening scenes at Bag End at the start of the An Unexpected Journey, Plan 9 composed it well in advance of the shooting. According to the members of Plan 9 they initially conceived several different melodies for the film makers to choose from and the final version now heard in the film emerged slowly as the clear favourite of Peter Jackson and his team. This piece also appeared in the early teaser trailer of An Unexpected Journey and gained wide popularity (including cover versions made for myriad instruments) in the internet prior to the film's release and in part created anticipation for the film. It is likely that the warm welcome of this theme and its hummable memorable nature also affected the way it was later incorporated into the actual film score. After the song’s initial appearance at Bag End in the film it migrates into variety of orchestral settings as Howard Shore integrates it into his score and it becomes a resolute thematic motto for Thorin’s company, a call to adventure and a symbol of the Quest itself. It signals the dwarven heroism and fighting spirit and follows the progress of their journey and appears at important junctions to sing out their valiant resolve to attaining their goal. This theme could be compared to the Fellowship of the Ring Theme from Lord of the Rings in its usage and style in the film, the melody fulfilling a similar role in this musical narrative and provides the audience with a melodic hook that helps them to relate to the dwarves. This motif comes to represent the initial optimism and heroism of the dwarven company, a familiar song of hope and resolve that slowly fades as the characters cross into the true Wilderland beyond the Misty Mountains. In a late 2013 Tracksounds.com podcast interview Doug Adams recounts that the film makers felt that this change or disappearance of the comforting leading motif would emphasize the danger, urgency and uncertainty of the second leg of the journey in the sequel, The Desolation of the Smaug, where Bilbo and his companions end up facing darker and deadlier perils before reaching the Lonely Mountain. Thus the Misty Mountains Theme is confined to the opening chapter of the story, its progression stopping at the edge of the very mountains the song title refers to. A thematic identification for the enmity between the dwarves and orcs but also specifically of Thorin and Azog that runs deep indeed. Used initially in the flashback to the gates of Moria where the grievous final battle of the War of Dwarves and Orcs took place (Azanulbizar in Khuzdûl) where young Thorin confronts Azog the Orc king of Moria and hews off his arm, turning the tide of the battle and rallying the dwarves to him. The primarily dwarven theme of chanting voices evokes the fatal unyielding spirit of the conflict while the melody advances stoically in almost staccato stanzas for male chorus and orchestra. Shore reprises this motif with even more furious drive during the final conflict in the Battle of the Five Armies as the old enemies are once again pitted against one another in single combat. This is actually one of the early abandoned concepts for one of the dwarven themes that was never fully incorporated into the first score and subsequently abandoned. A bold and victorious melody that seems to speak of the inherent nobility of the dwarven race and their heroic stature and by its first and only appearance in AUJ Shore seems to connect this melody with the dwarf lords and the Seven Houses of the Dwarves. The openly optimistic burnished brass and marching strings call out proud and defiant but the theme seems also to denote the dreams of grand alliances and dwarven race returning to its former greatness. Even though there is certain uncharacteristic liveliness in the flowing progression of the idea it still clings to the rising structures and angular forms of the dwarven musical world. NOTE: As said above The Dwarf Lords theme is used only once in An Unexpected Journey when Dwalin mentions Thorin and the council of the dwarven families and can be heard in an expanded concertized form on the bonus track Dwarf Lords but it was never used since in these scores. None of this material pertaining to the dwarf lords theme appears in the The Desolation of Smaug but in the last movie The Battle of the Five Armies Shore creates a new thematic idea, Daín Ironfoot's theme, which shares the same optimistic and lively heroic character while never actually quoting this earlier concept in any way but in stylistic sense. The music of the dwarves first isolated in Moria in Lord of the Rings, the deep male voices chanting, the rising perfect fifths and the at times harsh and sometimes finely chiselled arching musical structures return in The Hobbit as part of the larger dwarven musical culture, not confined to Khazad-dûm anymore. While this musical idea is featured prominently in the flashback sequence of the battle of Azanulbizar at the gates of Moria it now assumes a more active role of a living rather than a past culture, the predominantly male choral music blooming into dramatic and heroic heights during the journey as Shore musically charts the course of the dwarven history and of our heroes. The rising perfect fifths start to appear with more frequency as well throughout the score to accompany our 13 dwarven protagonists at many turns. The Shire and its inhabitants are 60 years before the tumultuous events of LotR much as they have always been: peaceful, quiet and lovers of everything that is green and good in the world. For Hobbits and their homeland Shore reprises his familiar music from Lord of the Rings, the verdant warmth of the Shire theme in different settings returning very much undiminished, the Hobbit music offering a solid appealing emotional anchor in Middle-earth. The music also bridges the gap between the frame story of Bilbo writing his memoirs and the adventures of his younger incarnation in the present Hobbit’s Tale. But Shore does not rely solely on the older themes for the Shire to underscore the new adventure and thus Bilbo Baggins’ younger days receive several brand new themes of their own, derived in part from the original Shire material but gradually covering new ground as our reluctant hero makes his way through the story and finds new dimensions to his character. This optimistically ascending melody is best heard at 0:15 in the whistle in "The World is Ahead" relates to Bilbo's adventure in a form of A-B-C#-E-E-G#-G#-A-E-C#-E-D as Doug Adams mentions in his blog regarding Bilbo’s multiple thematic ideas. It is a courageous but gentle music depiction of Bilbo’s burgeoning heroism, which grows from small roots in the Shire and can only grow in significance as he travels farther into the wide world to see its wonders. The leaping melody is presented a few key times in the movie at such points where our small protagonist is made to show his true quality. It begins heavily informed by the musical contour of the Shire material but soon links itself with the dwarven musical world as the hobbit joins their company and begins the quest of Erebor with them. This music relates to Bilbo as much as it does to the dwarves and so Shore unites the Shire Theme’s stepwise melodies with the stoic and proud dwarven rising figures to create a motif that speaks to both. In the film this melody is heard only briefly, probably initially planned to reserve its true heroism and resolute excitement for the sequels. It sings for Bilbo’s initial enthusiasm to set out on an exotic quest on solo tin whistle and horn and makes few noble heroic appearances towards the end of the film and and can be heard in a boisterously heroic form in full orchestra in a concertized form on the track called Erebor, where bagpipes further add a clear Celtic dimension to the joined venture of the Hobbit and 13 Dwarves. NOTE: This theme was in the end toned down in the sequels and makes few subtler appearances throughout The The Desolation of Smaug and The Battle of the Five Armies but never again gains the fully exciting heroic tone we glimpse in An Unexpected Journey. It has been speculated that this theme is actually Shore's answer to the Misty Mountains, a theme for Bilbo and Thorin Oakenshield and his company yet it is certainly sounds to my ears more tied to the Shire than to Ered Luin in its style but few hints of Shore utilizing it in the place of the Misty Mountais theme in alternate passages that found their way onto the soundtrack suggest it might well have been meant as his own heroic main theme for the company. Bilbo Baggins, our stalwart if much of the time out of his depth protagonist is a model of a country squire, but he has Tookish blood in his veins, an adventurous streak that he didn’t even know was there, until it is awakened by the arrival of Gandalf and Thorin’s company. Shore treats this duality of his character with a two-part theme, one phrase calling him back to the comforts and peace of his beloved green Shire and the other drawing him inevitably to adventure. Doug Adams refers to this pair of thematic phrases a “theme-and-a-half”, which is a good way to describe this theme with dual purpose. The opening part of Bilbo’s Theme is a lovely and gentle extension of the Shire’s stepwise writing, lyrical, nostalgic yet thoughtful, full of the deep rooted Hobbit wisdom, ever calling Bilbo back to Bag End on his adventures. The melody at its mid-point bears some resemblance to the form of the Bilbo’s Song from the end of the Return of the King in its beautiful and involved lyrical emotionalism, perhaps the most sophisticated part of the Shire’s musical world. Bilbo’s timid peace loving façade hides a secret wish for excitement and adventure. Here the Shire material after an introspective and mature bridge section arches ever higher in yearning, perhaps for adventure, perhaps for heroism, with leaping intervals and stout confident tone as Doug Adams states in his liner notes. It is this tug that finally leads Bilbo away from the comforts of home and to great deeds on his way to Erebor. NOTE: This musical idea was all but removed in the first film and the film makers replaced most renditions heard in the movie itself with various variations of the Shire theme (A Hobbit's Understanding or the Hymn Setting mostly). This was perhaps due the shifts in the way the movie makers wanted to emphasize subtexts in the film, the replacements favouring the musical depictions of the hobbits and their qualities as a race instead of singling out Bilbo specifically. Furthermore the sequel The Desolation of Smaug saw very subtle further variations on these ideas so it could be construed that Peter Jackson and Howard Shore considered Bilbo's material perhaps too mature and too well developed and independent from the Shire theme and its variations to be applicable to his character in the first two films. The Battle of Five Armies shows us the end of the journey of this maturation of the character and this musical theme makes very veiled and disguised appearances there but in the end the film makers preferred to employ the Shire theme and its various setting for him so you could say they largely discarded the notion of individual themes for Bilbo Baggins himself as a character. But we can enjoy Bilbo's beautiful and thoughtfully constructed music through the soundtrack album of the An Unexpected Journey where it is used quite extensively. Bilbo’s fussy and out-of-his-element side is depicted by a dancing waltz-melody and rhythm that underscores his more awkward attempts to adjust to a life of an adventurer and the sudden change of his comfortable life in the Shire when the dwarves whisk him off to an adventure. There is a haltingly humorous and off-kilter quality to the theme, mirroring Bilbo’s doubts about the whole Quest and depicting his comical reaction to his rowdy travelling companions at Bag End and on the road to the East. It functions as a comedic theme throughout the first film and parts of the second but disappears by the third movie as Bilbo returns home a changed hobbit. The quirky folk tune like melody itself dances a bit uncertainly over the waltz rhythms often conjuring an unbalanced feel, Bilbo threatening to topple with his music under the sudden new responsibilities. This motif to my mind draws a connection to a pair of rather comedic rascals, Merry and Pippin, whose own humorous and a bit dangerous escapades earned the Hobbit Antics setting of the Shire Theme in The Two Towers. Doug Adams adds that this type of writing is seldom used in The Hobbit or The Lord of the Rings, the certain level of contrapuntal sophistication mostly out of bounds of Shire’s simple musical motifs. The Shire is much as it has ever been with its peaceful way of life, which the sprightly Rural setting of the Shire theme conjures with vivid accuracy in the music the gait of the unhurried and homely life, the steady heartbeat of the Shire. This serene and bucolic setting of the Shire theme also accompanies the opening scenes in the Shire and provides the title card of the film its warm glow, the deep rooted warmth and gentleness of the idea again providing level headed Hobbit sense to our smallest of heroes on his way in the wide world and even offering comfort to Gandalf in his moments of doubt. The rhythmic Shire accompaniment figures return in this score and once again follow the life of the Hobbits in the Shire and hurry along Bilbo’s awkward capering when the dwarves invade his abode but the End Cap figure does travel with Bilbo further afield when he goes on his adventure. The simple wisdom of the Hobbits and the courage that springs from it guides Bilbo even when he is thrust in the middle of events far greater than he is and the wizard Gandalf also teaches him some worthy lessons along the way and so A Hobbit’s Understanding appears again at the most pivotal moments of decision in the story as our small hero shows his mettle, the gentle and honest way of life of the Shire, Hobbit nature and Gandalf’s wise words guiding his actions. This motif illustrating the hobbits at their most boisterous, playful and energetic follows Bilbo's exploits through the first part of his journey and adds a musical spring into his step especially in the opening scenes in the Shire weaving through Bag Eng as Bilbo tries to wrangle his rowdy dwarven guests. Howard Shore represents the elven cultures of Middle-earth with their unchanging musical idioms, both Rivendell and Lothlorien themes appearing in their most traditional forms, still unaffected by the coming War of the Ring and the tides of the Age, taking the guise they had when the listener first encountered them in Fellowship of the Ring. Both themes exude almost youthful grace in their original settings, the composer capturing in The Hobbit their original sense of wonder and mysticism and expanding upon it. Also a fleeting hint of the music of the Elves of the Woodland Realm is introduced in the first score, choral voices subtly introducing a central theme of the sequels in the prologue of the first film. The Elves of the Woodland Realm of Mirkwood appear fleetingly in the prologue of the film and here Shore has a chance to introduce an embryonic form of their music. Thranduil, the king of the Wood Elves and his followers are underscored by a slightly exotic Eastern tinged female choir phrase but it disappears almost as soon as it entered, offering a tantalizing hint of things to come. This music seems to reflect the general aesthetics of the Elven music with its clear lined, flowing and lyrical approach and the Eastern musical inflections that inform the ancient cultures of Middle-earth such as Lorien and Mordor also appear in the theme for the Woodland Realm. Although its appearance is a mere fleeting glimpse, this leitmotif becomes one of the central themes of The The Desolation of Smaug and The Battle of the Five Armies as the wood elves play a large role in that part of the story. Imladris the refuge of the Elves, the Last Homely House West of the Sea, is still unchanged at the time of The Hobbit and Shore brings back the glowing, majestic and nearly jubilant tones of the Rivendell Theme, this time perhaps even more sumptuous than before, female choir, tolling bells and harp glissandi expressing wonder and beauty, while the Elven arpeggios rise and fall in a calming and reassuring fashion as Elrond welcomes the company to the refuge of Rivendell. This is music of a vigorous and vibrant culture but slowly the arpeggio lines receive a patina of melancholy and darker cast seems to forebode the growing evil in the land, the theme becoming more subdued and serious as the White Council convenes, the orchestration favouring lower registers and fragmented readings of the theme. It also crosses paths with the dwarven music as Elrond, a renowned lore-master, aids the company in deciphering the mystery of the Moon Runes and in this fashion helps them on their quest. Galadriel, the Lady of Lorien, takes part in the White Council's meeting and she is introduced by the more exotic of the Elven themes. The mystical glow of the Middle Eastern maqam hijaz scale suggesting the theme seemingly radiates from her persona, the ethereal presence of Galadriel earning a choral incantation of the material complemented by the specialty instruments and orchestrations emblematic of her realm and culture. Later a beautiful lyrical woodwind setting of the Lorien Theme underscores her discussions with Mithrandir, to whom she offers her support over Saruman the White. And what would our heroes be without their opposing force, which in this story is represented by a multitude of threats. First there is the shadowy figure of the Necromancer, a mysterious sorcerer who has set up his lair in an old fortress of Dol Guldur in Mirkwood, and is now spreading his corrupting evil influence upon the forest and the world from his awful dwelling. Also a huge pale Orc hunts Thorin’s company with packs of fierce gigantic wolves, wargs, and an oafish trio of Stone Trolls threatens to devour our heroes on their journey from Bag End to Rivendell. The caverns of Misty Mountains are teeming with disease ridden, violent and horrid Goblins and looming far away beyond countless leagues in the East is the fearsome dragon, Smaug the Golden. Shore constructs thematic material for all these menaces that effortlessly exists beside the similar music of the LotR trilogy. In fact many of the motifs for the forces of Evil seem to be directly linked to the past thematic constructs and do indeed present embryonic or initial forms of many familiar themes from LotR. Not only do they provide a sense of continuity but work as musical hints and direct links to the rising Shadow and gradually shift through this trilogy towards their final guise in The Lord of the Rings. A simple pair of descending major thirds seems to be the most apparent of the three themes associated with the Necromancer, and forms a constant brooding, obsessively repeating menace that haunts the thoughts of the White Council and the Wizards. It bears very strong ties to the Mordor Descending Thirds accompaniment figure, which hunted Frodo and the Fellowship and trailed in tow of the Nazgûl and the Orcs in LotR, but this new low register growl is usually performed portentously and slowly in AUJ and thus loses some of the drive of the Descending Thirds. It could be surmised that this motif represents the early and still mysterious threat and thus the theme feels incomplete in The Hobbit but despite of this it carries the same inevitable sense of doom even if in somewhat more lugubriously static form. The 4-note form is often completed by one or two extra notes that sink lower and lower into the orchestra, creating a sense of finality and completion that the pair of descending thirds naturally lacks when they repeat obsessively time and time again. This is music with a dark promise which the Mordor Descending Thirds fulfils in The Lord of the Rings as Sauron’s threat becomes fully apparent and Shore gradually begins to shift the motif from its origins and closer to the Mordorean incarnation during the Hobbit trilogy. This motif is also clearly the root of Azog's theme and offers a very audible hint at the Orc king's true allegiance. Doug Adams musically characterizes this theme as A rising three pitch figure that avoids a downbeat and it seems to present a more active threat, bursting forth when the evil sorcerer displays his power as when he attacks Radagast in Dol Guldur or menaces the wizard’s home at Rhosgobel but it also appears to signal the slow growth of this evil, rising ever upwards to trouble the councils of the Wise. The motif is urgently insistent, Shore using a repeating variation to emphasize approaching danger and is most closely associated with Necromancer himself and his dark abode. As with the Dol Guldur Descending Thirds, The Threat of Dol Guldur seems to form the roots of the Mordor Skip Beat that so often set a frantic, nervous pace for chases and enemies hunting our heroes in LotR and the new motif essentially takes the first six pitches of the Mordor Skip Beat and plays it through its transpositions over 3 keys (F minor, A minor and C minor) to achieve an urgent, imperious presence whenever it appears. The mysterious evil sorcerer, who is actually the Dark Lord Sauron in disguise, is represented again by The Evil of the Ring/Mordor, which he can’t shed even in his shadowy form in Dol Guldur. Shore quotes the material a scant few times but offers a strong musical clue to the identity of this new Evil that has risen in Middle-earth. The composer truncates the ending of the melody so that it trails off into an exotic new coda but this creates a feeling of absence, the musical idea not quite fulfilled. Shore unveils the fully formed Eastern tinged melody of the ancient era of Middle-earth, when the mystery is finally solved and the Enemy reveals itself in The Desolation of Smaug where a thunderously imperious variation recalling its mightiest appearance at Minas Morgul in The Return of the King assaults Gandalf when the Grey Wizard finally uncovers the truth about the master of Dol Guldur in The Desolation of Smaug. In The Battle of the Five Armies the theme is treated to a lugubrious and wicked organ led readings as the Dark Lord confronts the White Council. Azog, the orc king of Moria (in the films receiving the epithet The Defiler), whose arm Thorin hewed off in the battle of Azanulbizar and who was thought long dead, mysteriously survived and is now burning with vengeance and hunting down Thorin Oakenshield and his company with his pack of Warg riders. Shore provides him with a straightforward, aggressive and ominous motif that according to Doug Adams is formed out of a pair of descending thirds (G-Eb-F-D) that is finished by a chromatic barb (Eb-D-Db) which exudes brutal rage and malice. The theme also holds a clue to Azog’s true allegiance and motives as its form seems to be closely associated with the Dol Guldur Descending Thirds, clearly hinting that the evil of the Orc is just an extension of Dol Guldur’s growing shadow. The gigantic ferocious demonic wolves that the Orcs use as mounts receive a theme of rolling, sleek and fast paced series of figures that Doug Adams’ describes thus: “over repeated eight notes, four-note patterns in E minor simultaneously rise and fall... Tromping figures for piano and taiko underpin snarling brass fanfares”. The fugue-like repetition creates a sense persistent pursuit, a breathless presto that threatens to overcome the weighty music of the dwarves. There is surprising melodicism in this music for the wargs and their riders, the stomping repeated phrases creating a gleeful and persistent hunting presto. Here and there subliminal nods to Mordor music, especially the ritualistic clotted harmonies of the Ringwraiths, can be heard in the pressing staccato rhythm and sharp string stabs that drive the piece forward and the idea seems to bear subtle traces Cruelty of the Orcs, another motif hearkening back to LotR, forming the backbone of the 4 downward surging clotted chords that symbolize the terror of these creatures. The last but certainly not the least of the villains in the story is the fire dragon Smaug the Golden, the greatest and most horrible of all terrors of the Age, who laid waste to the kingdom of Erebor and desolated the town of Dale and all the lands surrounding the Lonely Mountain. Reportedly Shore’s approach incorporates both the Eastern tinged musical ideas related to the past ages of Middle-earth heard e.g. in the music of the Lothlorien elves and Sauron/Necromancer but also gives a slight nod in orchestrations and the form of the musical ideas to the music of Far East, where dragons prominently figure into many legends and myths. a) Smaug's Breath/Dragon-sickness: As Doug Adams describes in the liner notes A searing pair of chords (F-major-F-minor-F-major-F-minor) pulses and heaves underneath Smaug's pair of themes, almost like a furnace or gigantic bellows. As many of the composer’s themes it attains an organic almost breath-like pattern, rising and falling naturally and fatefully as we see the great beast on-screen providing almost subliminal tension to these scenes. This music appears in isolation in the prologue of the first film but effectively drives the latter of half of The Desolation of Smaug and continues to harry the Free Peoples in The Battle of the Five Armies. This simple motif of alternating chords also denotes chiefly of all Smaug's thematic ideas the dragon-sickness, a malady of the mind that takes hold of any who start to covet the massive hoard of wealth the wyrm has piled into his abode from the dwarven kingdom. Same madness and lust for treasure runs in the line of kings of Erebor as Thrór was as susceptible to it as the dragon itself and now his grandson shares the same affliction. This will cause the music of the great drake to realign itself in a most unusual fashion with another characer, a unique shift in Shore's Middle-earth scores, as it migrates to Thorin and takes over his mind in The Battle of the Five Armies. b) Smaug's 1st Theme (Smaug the Golden): A sinuous, cruel and sharply angled melody seethes on top of it and worms through chromatic intervals with an exotic gleam is Doug Adams' apt description for this theme in conjunction with the two-chord motif mentioned above. This is the first thematic identity of the fire dragon and appears during An Unexpected Journey’s prologue when we see fateful glimpses of Smaug laying waste to both Dale and Erebor, the music exuding imperious aggression, rage and violence. It is short and to the point and thus can be easily and quickly quoted in a short space of time but Shore provides the great drake of the North with a second theme as well. c) Smaug's 2nd Theme (The Malice of Smaug): The complexity and wicked cunning of Smaug’s persona led the composer to complement his manipulative evil with a musical mirror image of the first theme, a longer melodic line that is actually an inverted variation on the first idea, which complements the wyrm’s multifaceted persona with dangerous cold cunning. This subdued and more ominous variation of Smaug's music appears once in An Unexpected Journey when Bilbo is first told of the Great Calamity, the ghostly clang of Tibetan gongs and bass drum pulsing together underneath as strings and woodwinds play an inverted version of the reptilian main theme for Smaug, a horror Bilbo can scarcely even imagine. This third idea also holds a key to the central instrumentation used for the great drake as in The The Desolation of Smaug the dragon is depicted by a whole host of exotic Far Eastern gamelan percussion instruments and subtle incorporation of erhu, a Chinese stringed instrument. In The Battle of the Five Armies the theme expands its palette further as it becomes an insidious musical barb in Thorin's mind when keening strings and ticking metallic percussion haunt him as this motif for Smaug's wicked persona now latches onto the heir of Erebor. Another subtle foreshadowing musical connection of the first score relates to a Fourth Age theme from The Lord of the Rings, Witch King/the Orcs of Mordor that ever imperiously rose to crush the World of Men in RotK. In The Hobbit Shore hints at the dark revelations to come, when Gandalf tries solve the mystery of the Morgul Blade, the theme appearing as a quiet but none the less uncomfortable whisper at the tombs of the long dead servants of Evil and their sorcerer king at High Fells. NOTE: The music containing this theme was composed for an early version of the scene that was finally removed from An Unexpected Journey and moved to The The Desolation of Smaug. The bonus track on the Special Edition of the AUJ soundtrack containing the theme (The Edge of the Wild) is an earlier draft of the piece used for the scene and in DoS this sequence was entirely re-scored and while the opening musical idea is reprised in the revised cue (High Fells on the DoS soundtrack) the Witch-King of Angmar/The Orcs of Mordor theme was discarded. A new Nazgûl related thematic idea, a ghostly choral chant simply named The Nine, is used in its place instead. And it has to be said that while the thematic nod to the Return of the King might have been a nice gesture, the Fourth Age theme does not really sit easily into the thematic architecture of the piece. The Hobbit’s tale features unusually many of the Istari, the Wizards, of whom three appear in this film series. The composer offers each their own musical devices. 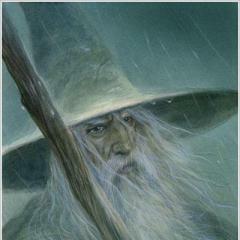 Most notably Gandalf the Grey, who was a mediator and mover of things in The Lord of the Rings and to whom Shore didn’t assign a particular motif in that trilogy (Gandalf the White was another matter though), receives in the first part of this earlier adventure two prominent leitmotifs, which work both independently and together. Radagast the Brown has a snapping and whispering forest of orchestral sounds all to himself and peculiar collection of percussive sounds propelling him forward in his curious but at times dead serious work. And lastly Saruman the White seems to harbour grave concerns and dark thoughts behind his heavy lidded eyes as his familiar theme from The Lord of the Rings trilogy announces his presence at the White Council. Doug Adams calls Gandalf the Grey’s theme a musical nudge out at the door, which sends Bilbo on his adventure and indeed Gandalf’s compact little theme seems to be closely related to the music of the Shire, a place the Grey Pilgrim holds dear to his heart. This small whole step melodic turn is insistent, always ready to peek through the fabric of the score and as Mr. Adams says it is indeed unassuming yet subtly disruptive. It denotes the wizard’s presence and his helping hand, whether meddling into the affairs of the dwarves or hobbits, appearing at the nick of time to bail them out of trouble and sending them on their way, showing the wizard’s powerful but often subtle influence. Gandalf the Grey presents subtle references to the music of the Shire and Bilbo specifically, the whole step wise movement attaching itself to this concise idea and this theme wanders through the score and seems to be forming a musical ties to the other themes it meets along the way. The order of the Wizards, The Istari, is also depicted by a thematic idea, which in the course of the Hobbit trilogy becomes most strongly attached to Gandalf's presence and his friendship , a searching lyrical melodic line that moves initially in an up-and-down figure but then it ascends ever higher in graceful leaps. It alternates with the more active primary theme as a musical identity for the wizard in the first Hobbit film. The primary motif and this lyrical longer secondary melody form a tightly knit pair in the same way as the two parts of Bilbo’s Theme do, each seemingly part of one longer music idea. It appears most often when Gandalf is giving counsel or rallying his comrades, imparting a sense of confident strength tempered with wisdom and most importantly often underlining his friendship with the dwarves and the hobbit. While this theme, which Doug Adams commented to have a broader usage than just a secondary melody for Gandalf and initially was meant to depict the whole order of the wizards (it does indeed make its first appearance when Gandalf is recounting the names and colours of all the Five Wizards) is largely absent in The Desolation of Smaug (as the wizard is largely away from Thorin's company too), the idea returns at the end of The Battle of the Five Armies as both the Grey Pilgrim and the hobbit meet in the aftermath of the battle and return home from their journey although the music appears in a heavily transformed guise, perhaps to show us the change in the characters. The brown wizard also has a secondary idea tied to him, but it is very closely knit into the collection of his other musical sounds. Radagast’s often nervously busy music surrounds an eerie choral and orchestral motif, which contains references to the nervous rising and falling string figures of his music wedded with another long lined melody winding on top of it, creating in the process a new motif. This music is according Doug Adams (commentary on his blog) also tied to the Brown Wizard and his powers. Its initial apperance in the orchestra and boys choir seems to suggest some subtle connection to Nature in the pure tones of the choral accompaniment but it later appears when Gandalf conveys his dark news and findings to the White Council where this musical motif underscores their grave conversation, the theme expressing both Radagast's message and the ominous weight of his news, now transported into the more mature sound of a female chorus. NOTE: Radagast's musical tree of effects was severely cut in the final film and much of the nervous percussion and violin work was left out of the picture, the composer instead using a less thematic approach to the nature wizard's initial introduction. Similarly the boys chorus was largely left out of the orchestrational palette of the theme, Radagast's music becoming largely orchestral. A recurring motif for Gandalf’s fireworks appears in The Hobbit: An Unexpected Journey to draw a connection to The Fellowship of the Ring and providing another ancillary musical phrase related to Gandalf as he first meets Bilbo, the excited leaping motif rekindling memories of this wandering conjurer in the mind of our protagonist, who when he was just a small lad admired the wizard’s splendid skill at creating the most marvellous rockets. Saruman the White is once again represented by the ominous Isengard theme, whose appearance is tempered only by its brevity in the film, Shore offering us a savvy musical reminder but also observing thematic continuity. Nature is a strong force of Good in Middle-earth where purity and inherent rightness of things dwells and its servants appear also in The Hobbit to battle the enemies of the natural world and save our heroes from a certain doom. The Great Eagles represent a lofty incarnation of Nature’s power, while the music of Radagast the Brown bears traces of Nature’s benevolent will working in Middle-earth through the wizard. The Giant Eagles of the Misty Mountains, previous treated as an ally of Nature and always appeared underscored by the Nature's Reclamation have now gained a new motif related specific to them and the aid they bring to their friends. This new theme is heard in AUJ only in the film itself as it was another revision done to the score and Shore initially composed a very different finale for the film, which can be found on the AUJ soundtrack album. The new rescored ending contains a haunting chorus and soloist theme which is then reprised in The Battle of the Five Armies as the noble avians arrive to turn the tide of the battle, the soaring but lyrical lines annoucing elegantly their timely arrival. The proud and lyrical Nature’s Reclamation appears with majestic purity as the Eagles arrive at Gandalf’s behest to safe the dwarves from the hands of Azog and as they carry our band of adventurers away, the choral and orchestral forces celebrating as much the last minute rescue as they do the vanquishing of the evil Orcs that have pursued Thorin’s company. Shore’s theme for Nature is unchanged in the Hobbit, carried by pure choral sound that ascends gracefully to lofty heights, the power of the natural world as timeless as the Elves. The theme makes a brief appearance on the soundtrack album on the track Out of the Frying-pan and originally Shore wrote a very different choral setting for the rescue sequence using entirely different thematic material but in the end the film makers ended up using a full fledged version of Nature's Reclamation for the scene. These giant arachnids that thrive in the now darkened Greenwood are seen in AUJ assaulting Radagast's home at Rhosgobel and earn a suitably spidery 8-note tone row that rumbles with a taut rhythmic threat. Taking its lead from the music of Shelob in the RotK which also built on a similar 8-note row, the Mirkwood Spiders motif is heard only once in the first film when Radagast finally perceives them assaulting his abode. While Shelob's motif implied cunning intelligence and had an evasive, stalking quality, the music for the giant spiders is much more exclamatory, a piece of true old fashioned straightforward monster music. Bill, Bert and Tom, the three pony stealing Stone Trolls, who have come to lowlands after some sweeter meats, are represented according to Doug Adams by a waltz humoresque, a plodding figure suitable for their dull wit, slow gait and tough hides that skirts Bilbo’s burglarious activities in a careful dance that begins with light humour, but ends in a ferocious fight as the swaying theme receives its heaviest setting when it battles with the dwarven music for supremacy. Denizens of the endless tunnels under the Misty Mountains the goblins of Goblin Town, distant cousins of Orcs of Gundabad, Moria and Mordor are a sordid and disease ridden bunch of creatures that capture Thorin’s company as it is crossing the peaks and seeks shelter from a storm in a shallow cave. Shore’s music for these horrid creatures is a series of jarring aleatoric figures, malevolent low brass exclamations that ooze evil glee and plodding mix meter rhythms as they overwhelm the dwarves with their sheer numbers and drag them to their king, the Great Goblin. Shore again stays true to the spirit of his previous music for the Orcs, which is sharp edged, brutal, hard and unpredictable, the orchestra snapping and slashing at different directions all at once in near manic chaos, which rises to fever pitch when they give chase to the dwarves through their subterranean kingdom. At the heart of the driving gnashing music is a repeated 3-chord construct that forms the main component of the threatening Goblin Theme. The mixed meters of roiling rhythms contained in the Goblin music present quick references to the 5 Beat Pattern, that was associated with the Orcs and their oppressive and most organized evils in LotR but here the rhythms do not stay in one pattern for long, lopsidedly rushing forward in disorder, while the aforementioned repeated 3-chord core of the Goblin theme holds the music together. It is the music of brutal malevolent chaos. Gollum makes his first appearance in the tales of the Third Age in Bilbo’s adventure and his dual musical persona established in The Lord of the Rings appears the instant he peers through the gloom in the tunnels under the Misty Mountains. This melancholy and altogether sad melody accompanies Gollum’s Smeagol side, the wretched creature’s almost childish fancy for riddles often underscored by slinking variation or hints at the harmonies of the this theme. This pleading, winding melody also awakens Bilbo’s gentler nature as he sees the ruined creature’s sad and lonely plight when it has lost the Ring and decides to spare its life. It is also the music that constantly shifts between the History of the Ring theme as Gollum's slavish need for it and the actual object go hand-in-hand in all their scenes together. Gollum’s evil and animalistic side once again creeps in with the help of a jittery cimbalom, the theme’s instrument of choice, but now it also subtly climbs into the string section, the Dies Irae-like readings suggesting deadly and murderous danger to Bilbo’s life as the schizophrenic creature plots to make Bilbo his next meal. The Middle-earth has not known the woe of the Ring of Power in millennia, yet now it appears into the histories of the world once more and with it arrives its signature theme. Only one thing is certain. It now has a fateful clang to it and it foreshadows our hero’s steps as he innocently becomes the newest owner of this magical ring whose origin is shrouded in mystery. What originally was inarguably the central theme of the Lord of the Rings, appears now in the Hobbit as a musical harbinger, flitting in an out of the score in quick variations, the composer often hinting at its opening pitches but veering to other directions, teasing the listener, the theme here a musical equivalent of a wink at the viewer/listener, its appearances always full of meaning. As the Ring finds a new bearer the theme is there to chart its progress, another new chapter in its long woeful history but interestingly Shore refrains from presenting the motif in its most traditional static guise heard so often in Lord of the Rings, the slightly askew versions heard on the soundtrack album suggesting perhaps the Ring’s active purpose to abandon its former bearer and get back to its true master and also that for the moment its history is in flux in the Hobbit. This is the primary theme that is used for the Ring throughout AUJ and its sequels whenever the magical Ring is somehow referenced and none of the other themes that are associated with the One Ring in Lord of the Rings are used directly to refer to the artefact. The influence of the baleful treasure is subtle and its hold only growing on Bilbo and thus its passage through the story earns only the theme that has carried it from one hand to the other and from one time period to the next. While the Evil of the Ring theme does appear in the score it is only associated with the Necromancer whose link to the Ring is yet to be revealed. Fantastic analysis Mikko! Really glad to see that this finally came to see the light of day. Exceptional work and all very spot-on as usual! Looking forward to your take on the other scores as well. The proud and lyrical Nature’s Reclamation appears with majestic purity as the Eagles arrive at Gandalf’s behest to safe the dwarves from the hands of Azog and as they carry our band of adventurers away, the choral and orchestral forces celebrate as much the last minute rescue as they do the vanquishing of the evil Orcs that have pursued Thorin’s company. Shore’s motif is unchanged in the Hobbit, carried by pure choral sound that ascends gracefully to lofty heights, the power of the natural world as timeless as the Elves. The theme makes a brief appearance on the soundtrack album on the track Out of the Frying-pan and originally Shore wrote a very different choral setting for the rescue sequence using entirely different thematic material but in the end the film makers ended up using a full fledged version of Nature's Reclamation for the scene. Not sure if its ever been pointed out, but I love how the new Eagle theme builds off the same vi-IV (Am, Fmaj) of the Nature theme and then continues with V-iii (Gmaj, Emin), sharing that characteristic 2-degree step quality of the opening Nature theme call. Thank you very much KK! And truly interesting points on the Nature's Reclamation and its connections to the Hobbit motifs related to the Eagles. If anything these scores really show Shore's intentional craft and sometimes purely intuitive mind at work in forging these connections in the music. Once again makes me wish I knew more about the musical theory as it would certainly give another perspective to this music. Those two themes (Nature, Eagle) segue into each other so well, you can probably write a lovely suite/theme demo with it! Maybe add Beorn's full theme too, since its built on the same progression. Typo fixed. But thanks Faleelr. You may notice I left out the pesky "Thorin's Pride/Haughtiness/Madness/something or other negative", which is used in the Brass Buttons and Out of the Frying-pan. Didn't Doug just recently point out that it was just an elaboration on Thorin's theme harmonies or something like that? Oh I'll be sure to check the correct articles and typos soon. Proof reading was a bit quickly done I have to admit. Which part of the Warg-Scouts are you refering to? Timestamps would be useful as always. 0:53, even if its not the same, it reminds me of it at least. What a bloated and over-the-top review. I heard Inky is planning on doing three threads for this one score? The man clearly lost it. I preferred him when he was more humble and knew that "more" doesn't necessarily equals "better". Bah! Well when I was in the middle of writing this I noticed I had more material than could be fitted into two reviews so I am planning to turn this into a trilogy. Also there is talk of turning it into high frame rate 3D experience. I'm excited! Perhaps it is a little reminiscent and as I mention above in the analysis I hear several other Mordor music elements in there as well. I am sure Shore injected as much as possible and applicable his older musical ideas into the construction of the new themes in The Hobbit. I am sure Doug Adams' book will soon be blowing me out of the water though. Doesn't keep us fans from trying though. I'll post the track-by-track analysis in this thread once I have gotten it polished and updated. The steady amount of small details that have trickled down to us of this score either by fan observations or through Doug in the couple of last years has kept me revising it. Where's the rest?!? Shameless marketing gimmick forces me to revisit this topic later. The 3D high frame rate rendering takes time! Plus I had to schedule rewrites when the review was split into three parts instead of two. The pickup sessions have commenced already. Since the postproduction has been so arduous I am thinking of hiring Conrad Pope to do some work. Not writing but conducting and arranging. Let me guess: Doug ghostwrote some passages? And what about Gondor Reborn? Is Inky going senile? He's past his prime now. It used to be Potter, Star Wars. Now it's just The Book Thief and War Horse. I know there was bad humor in the analysis and extraneous materials culled from the Appendices and some I invented myself but the extended edition will set some of those problems aright. But more seriously: great review as always Inky. Sorry I don't have any comment to give on it! That's what happens when you're given something that is well-written and well though-out! So, what can we expect next after AUJ? And the natural progression after AUJ would be Harry Potter and the Chamber of Secrets, right? I have to start typing those DoS and BotFA analyses pretty quick before Doug overtakes me and publishes his book. UPDATE: Disc 1 track-by-track analysis is up! Hey this really became a 3-part thing. Update: Since I could not fit the text of the track-by-track analysis in the same thread as the thematic analysis (yes oh gosh darnit it is that long windedly verbose!) so I created another thread specifically for that. This eerily reflects the way the movies were divided. There was just too much material to include in a single review! Can't wait for the three post version! I'll leave posts of that length to Doug Adams! Or perhaps my analysis of DoS will have three and BotFA four parts!